As we begin to approach winter in the northern hemisphere, so too does the southern hemisphere of our neighbouring planet, Mars. Set to experience its usual seasonal CO2 snowfall and lows of -125 degrees Celsius at the poles, it makes Earth seem pretty warm and cosy in comparison. This time of year sees the process of carbon dioxide beginning to ‘freeze-out’ at the southern pole, creating ice caps not unlike the ones that we are familiar with. Throughout the Martian year, the HiRISE instrument on board the Mars Reconnaissance Orbiter (MRO) captures images of the southern pole that the Planet Four community is helping to analyse. Between two seasons of imaging from the instrument a global dust storm swept across the red planet leaving a high concentration of fine grains in its atmosphere. The science team is eager to find out what effect, if any, such a large event could have on surface processes. By comparison of images previously analysed by the Planet Four community, this will hopefully lead to a better understanding of the different climate cycles and overall environment of Mars. As you will already know, the main goal at Planet Four is to examine the size, frequency and distribution of material that bursts out from under the CO2 ice sheets as they begin to thaw in the warmer months. During the Martian spring at the southern pole, the caps start to receive more sunlight and the ice gradually sublimates back into the atmosphere. As there is no liquid phase of CO2, this means that when the ice heats it directly evolves into a gaseous state and returns into the atmosphere. Sunlight penetrates to the very bottom of the sheet, which causes the ice to transform into gas far below the surface. Since the gas is trapped and continues to form, the pressure eventually becomes high enough that it erupts through the sheet, bringing with it the underlying material which can be clearly distinguished on the surface. The sediment left behind from these geyser-like eruptions is what we analyse in the images in the form of ‘fans’ and ‘blotches’. If no wind is present the material falls straight back down under gravity and forms a blotch; where it is present, the material will be blown as it bursts out and we observe a fan shaped feature of material spanning out from its source. 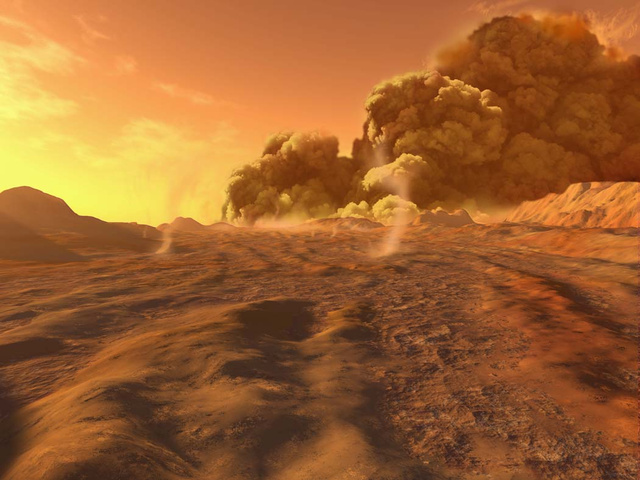 Dust storms and dust devils could have an effect on this process, as the atmospheric and surface temperatures across the planet change depending on the amount of airborne material. The phenomena arise due to solar radiation heating the planet’s surface and causing convective currents which sweep up the finest grains of material into the atmosphere. As the wind interacts with suspended particles, the gusts intensify and encourage more dust into the air. If the wind rotates as it rises the speed and spin will increase, due to the conservation of angular momentum, and a dust devil is formed. 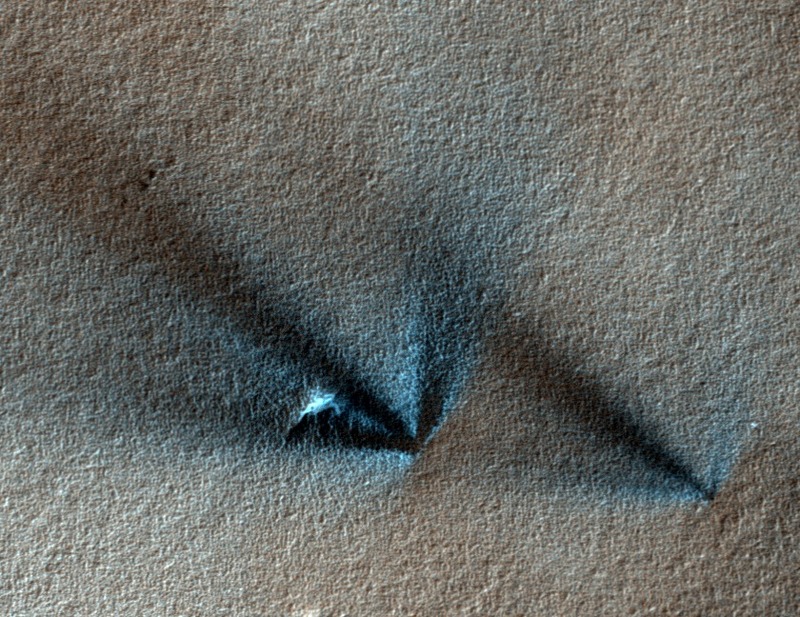 Unlike the swirling bodies of sand seen on Earth, Martian devils can stand up to ten times as high and 50 times as wide due to the planet’s tenuous atmosphere and lower gravity. Most dust devils and dust storms form and dissipate within a matter of hours, but around one in every three Martian years sees a storm evolve and sweep across the whole globe, masking the surface in a dusty haze. Planet-wide dust storms are most likely to form at the equator in summer time when the most surface heating occurs and bigger temperature variations are present, before spreading across the globe. One such storm took place between periods of data acquisition by MRO; so how does this affect the images analysed by Planet Four? 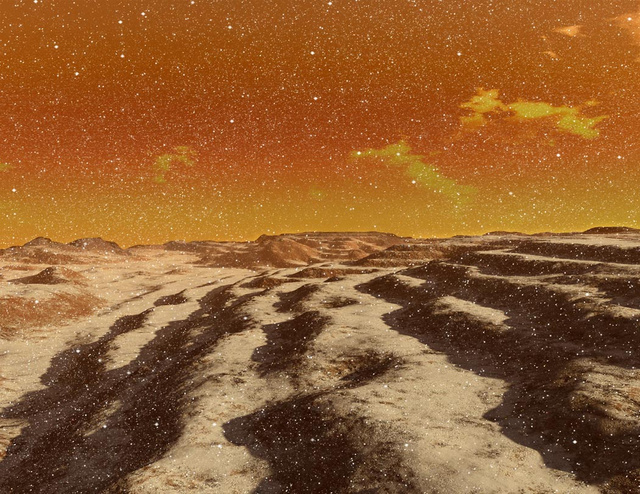 The global dust storm kicked up a lot of material into Mars’ thin atmosphere, where the finest grains can remain for a long period of time due to its cool and dry nature. This allowed more CO2 to condense onto the newly airborne dust, which later fell to settle and form ice sheets at the southern pole. The subsequently large amount of dust locked into the sheets following condensation will have affected the opacity of the ice, and therefore the amount of sunlight that heated its base in the spring. If less sunlight is able to penetrate the ice and heat the base layer, the whole process could have been delayed, causing eruptions to occur later in the year. As the fans and blotches are our only real indication of surface wind patterns on a large scale, whether the regions produce a similar network of marks or not is of great interest to the Planet Four team. The storm took place in 2007, between seasons 1 and 2 of HiRISE imaging. 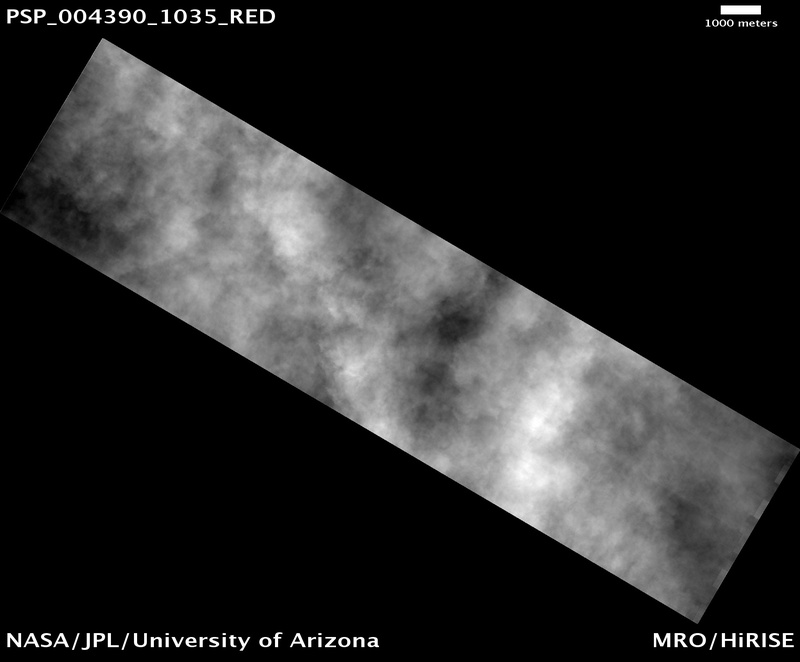 The picture above captured the event, where the surface was completed obscured by the clouds of dust. Planet Four participants have already finished analysing images from seasons 2 and 3, and are currently working through those taken during season 1. It will therefore be very interesting to compare the nature of fans and blotches before the storm with the already processed images taken after the storm, as they may produce very different results. Hopefully the data analysed will provide a clearer picture of how the two dominant cycles on Mars, dust and carbon dioxide, are interlinked. In turn, this should help to build our overall knowledge of the mysterious Martian climate. Please keep clicking and bring us closer to achieving this goal!